May the 4th was not only Star Wars Day but was also my mother’s birthday. 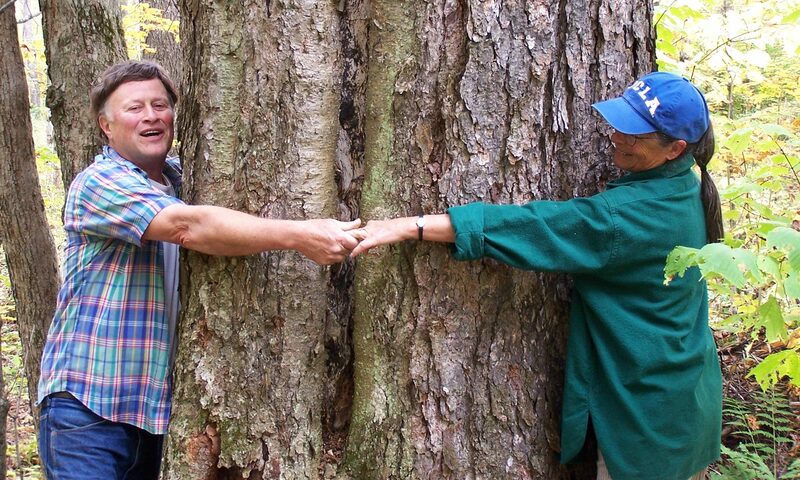 She died in February 2014. 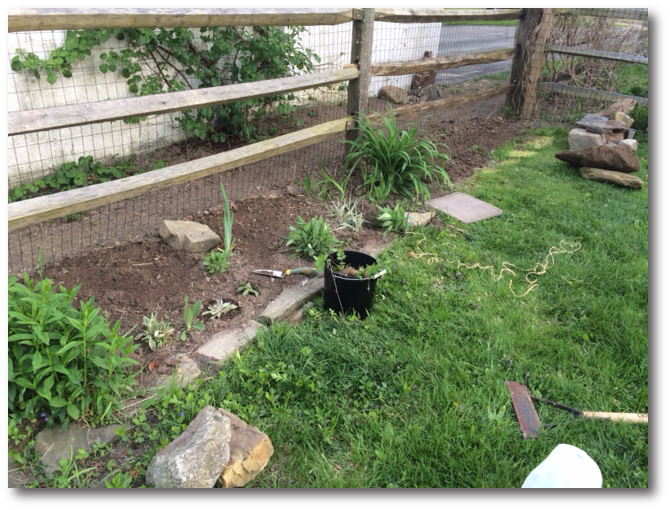 I decided to celebrate by taking a vacation day and digging in the garden, which was one of my mother’s favorite things to do (I’m pretty good in the garden, but I swear she could weed at least four times faster than me, and yes, I totally took advantage of that by enlisting her help more than once!). I did some weeding, including the final cleaning out of this one area of the yard into which we are transplanting a bunch of irises and day lilies that our neighbor was removing from his front yard (our new neighbors are not plant fans, apparently – they have also cut down a dogwood and a Japanese maple). 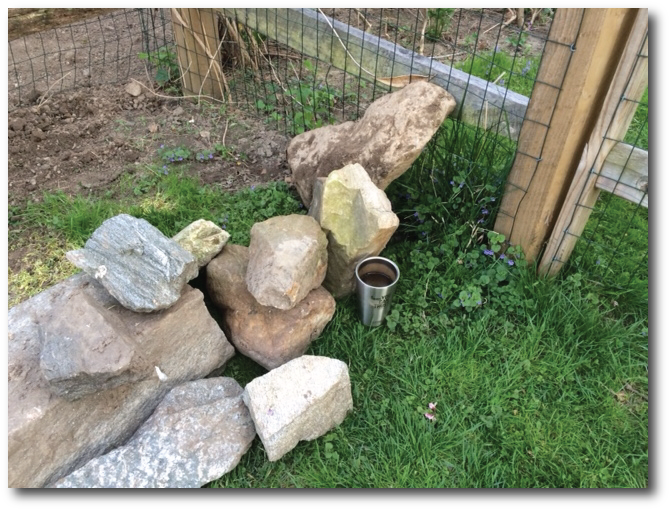 When loosening the soil in the bed, I hit a rock, and decided that I’d dig it up (another thing my tenacious and hard-working mother would have done). 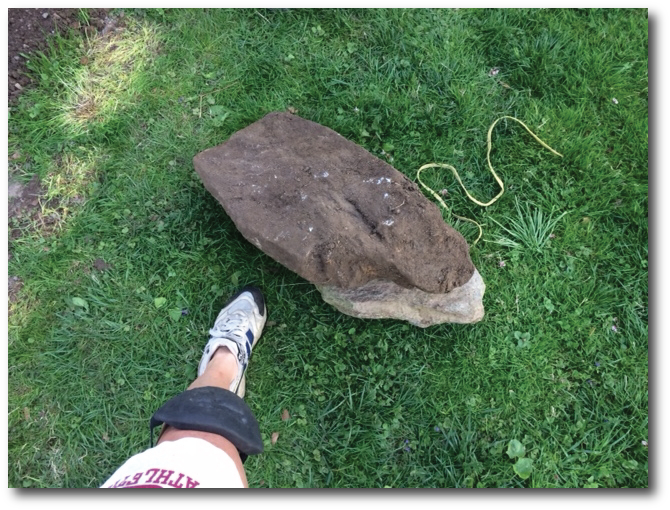 It turned out to be two large rocks – the one in the picture that includes my foot for scale (Estimation180 anyone?) and the one leaning against the fence in the other picture (which includes a pint glass for scale). But enough about my day off. 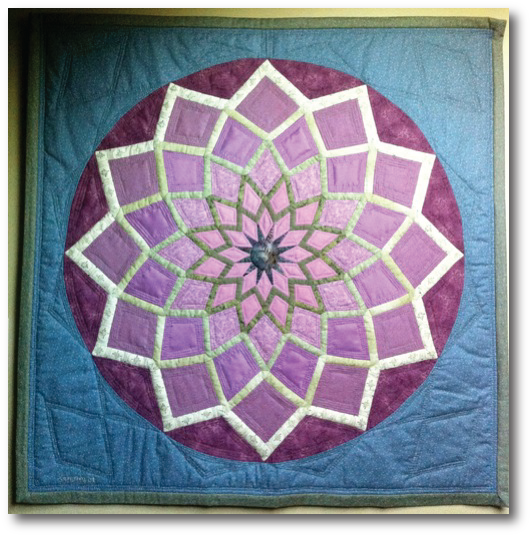 This is a math blog, after all, so I really wanted to talk about how my mother not only persevered when faced with a giant rock in her flower bed, but also when she was designing some of her fabulous textiles. 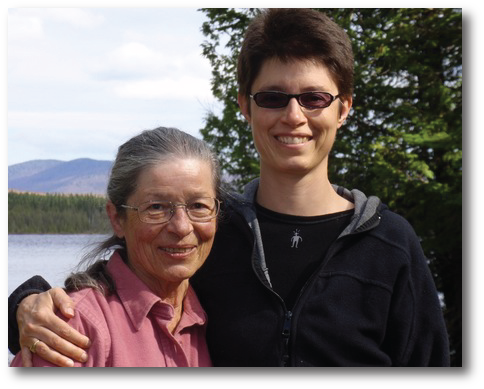 Let’s start by watching the Ignite that I did about her at NCSM last spring, shortly after she died. 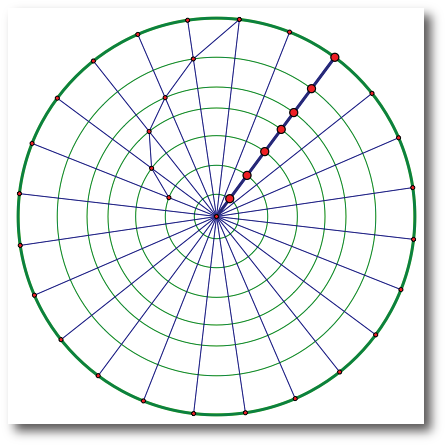 I stared at it a bit and thought about what I would need to pay attention to if I was going to reproduce it using Geometer’s Sketchpad (that is another way of saying that I Noticed and Wondered). Yes, Mom worked on paper, and didn’t have any problem redoing things as often as necessary, but I believe in the power and speed of something like a dynamic geometry environment so that the tweaking goes a lot faster once you’ve set up the initial relationships! As shown below, I took note of several things. First, the whole thing is a circle. 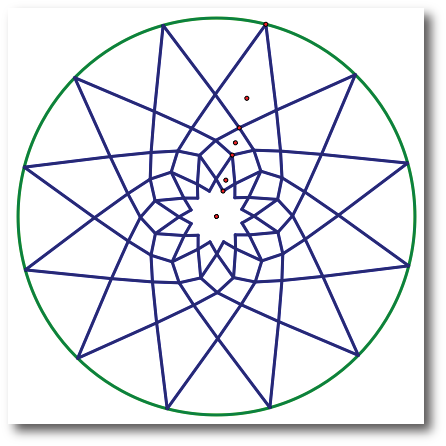 Second, there are 12 outer points (marked in red). 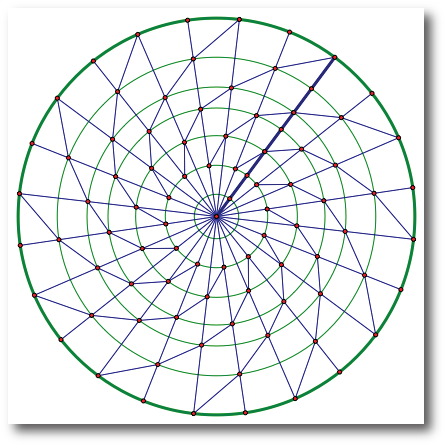 There are also 7 concentric circles underlying the design (marked in blue). 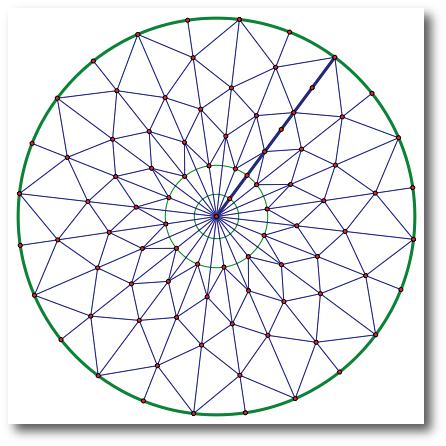 I noticed that I would need to construct 24 radii of the outer circle, and create points of intersection where those radii crossed the concentric circles. 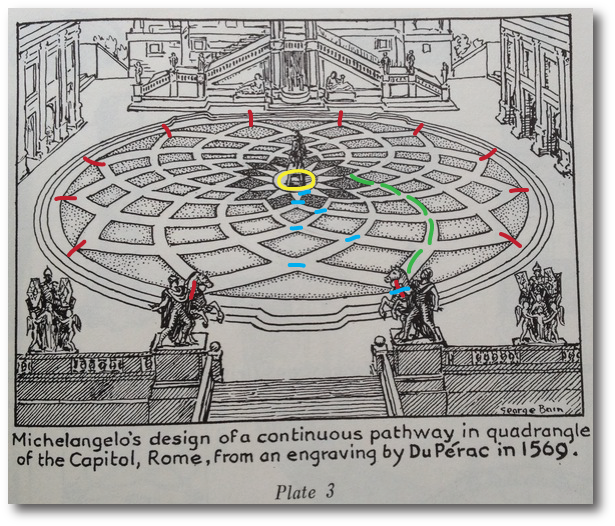 I also noticed that one “path” through the design consisted of “diagonals” of the spaces created by these radii and circles (marked in green). I was able to drag the points that control my circles until I got it just the way I wanted it. I didn’t see any more trial sketches in my mother’s files, but I do know that she definitely nailed it in the end! Consider all the sense-making she did. She couldn’t just measure the picture, since it was drawn in perspective, but she took away as much information as she could. She noticed relationships and used trial and error to figure out the parts she couldn’t count. She made mistakes and learned from them. And there is no question that she persevered! As I said in my Ignite talk, we need to be sure to look for and value these traits in our mathematicians, not just their ability to crank out answers to a lot of textbook problems really quickly. Look for opportunities for your students to practice sense making, maybe even by having them replicate some drawings! I’ll close with one more picture of my mom’s artwork taken in 2008. 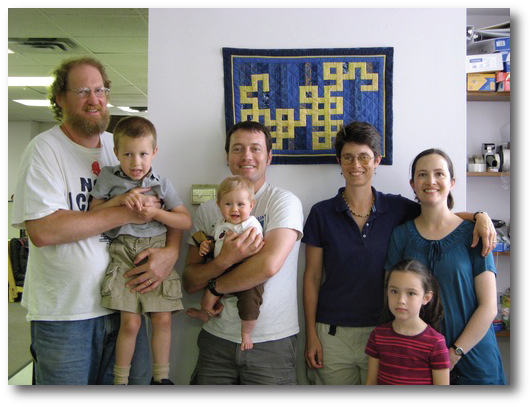 She made this quilt of the Math Forum’s dragon fractal logo for us to hang in the office. Did she know what a dragon fractal is? Nope. But she had the ability to pay attention to detail enough to get it right nonetheless. Also in the picture is my husband Riz (the tall one – Estimation180 clue is that I’m 5’10”), my sister Marty, her husband Silas, and their adorable children Olivia (7), Liam (4), and Clare (8 months). 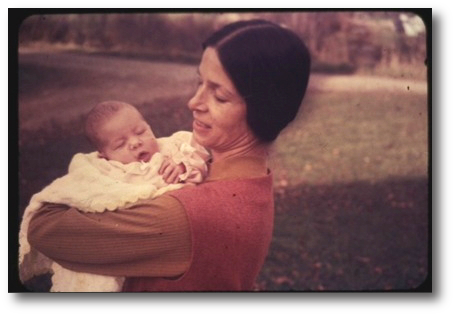 My mother inspired me in many ways as an artist and as a mathematician. We should all try to do the same for the young people in our lives. 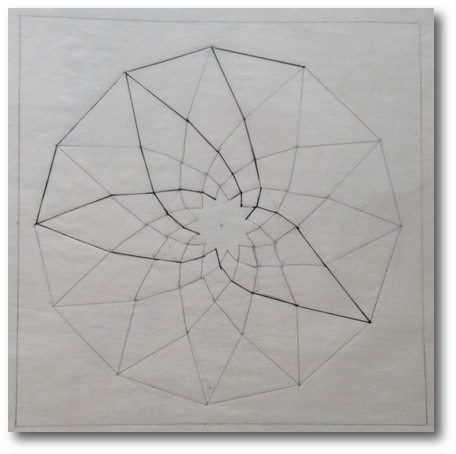 As my friend and math teacher/former architect Peg Cagle pointed out after I wrote this, it’s not a circle at all! Read more about the Piazza del Campidoglio or look for pictures yourself.